The Austin COC (Confederation of Clubs), had their first annual Chili Cook Off Saturday, and it was a great success. 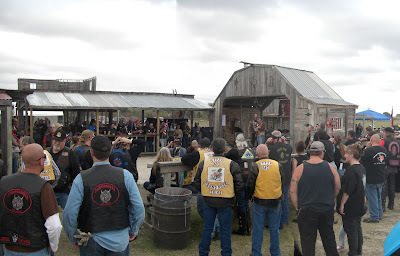 As you can see it was well attended by the local MCs and Riding groups. At least 10 different styles of chili were prepared on site and presented for sampling. I personally tried about 6 different kind, and I was amazed at how different they were from each other and yet they were all very good. I didn’t stay until the end for the judging, but I am sure many were qualified to be the best. COC is an organization that works through the political process to preserve the rights and freedom of motorcyclists everywhere. Always remember, This is our country, and the freedom we have, is only sustained through the exercise of our vote in the election process. Voting is a privilege and a responsibility. If you don’t vote, then you have no right to complain when you freedom is taken away, and it will be if you don’t vote. To put it another way, imagine someone you know that doesn’t happen to believe government should be run the way you do. If you don’t vote, they will get their way. Do you want that? Thanksgiving is next week, and I am thankful for lots of thing… or, well, perhaps I should say, I am thankful for lots of people. I am thankful for Jimmi, I’m thankful for Sputnik. Closer to home, I am thankful for my wife Debbie, and for my children, Pam and Chip, and I am thankful for my grandchildren, Chloe, Claire and Ezra. I am thankful for the privilege of being able to ride a motorcycle.